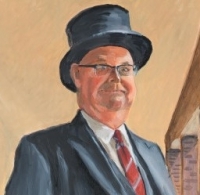 John Eisold, former Head Porter at Fitzwilliam College, is one of 25 Head Porters featured in a new exhibition of portraits by local artist Louise Riley-Smith. Head Porters are the unsung heroes of colleges and are the subject of a special exhibition, which runs until 24 June at the Pitt Building on Trumpington Street. Louise Riley-Smith has also completed commissioned portraits which include members of the diplomatic and civil services, senior academics and decorated military personnel.